Charibert II (607/617–8 April 632), a son of Clotaire II and his junior wife Sichilde, was briefly King of Aquitaine from 629 to his death, with his capital at Toulouse. We have no direct statement about when Charibert was born exactly, only that he was "a few years younger" than his half-brother Dagobert. His father Clotaire evidently had a bigamous marriage (not then uncommon) and he was the offspring of the junior wife. 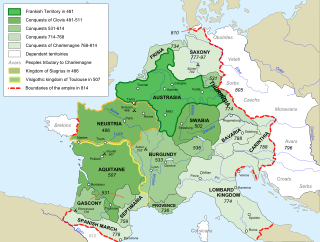 When his father, Clotaire II, King of the Franks, died in 629, Charibert made a bid for the kingdom of Neustria against his elder half-brother Dagobert I, who had already been king of Austrasia since 623. In the ensuing negotiations, Charibert, a minor, was represented by his uncle Brodulf, the brother of Queen Sichilde. 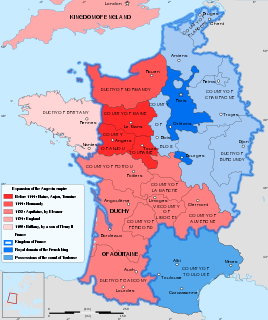 Dagobert had Brodulf killed, but did not intercede when his half-brother took over the near-independent realm of Aquitaine. Apparently this caused no disagreement, as in 631 Charibert stood godfather to Dagobert's son Sigebert. Charibert's realm included Toulouse, Cahors, Agen, Périgueux, and Saintes, to which he added his possessions in Gascony. Charibert was married to Gisela, the daughter of Amand, Ruler of the Gascons. His fighting force subdued the resistance of the Basques, until the whole Novempopulania (become Duchy of Vasconia) was under his control. In 632, Charibert died at Blaye, Gironde—possibly assassinated on Dagobert's orders—and soon after that Charibert's infant son Chilperic was also killed. Aquitaine passed again to Dagobert. Both Charibert and his son are buried in the early Romanesque Basilica of Saint-Romain at Blaye. ^ Jean Charles Léonard de Sismondi, The French under the Merovingians (1850), pp. 152–54. Wikimedia Commons has media related to Charibert II. Fredegar. 1960. The Fourth Book of the Chronicle of Fredegar with its Continuations. Translated by J. M. Wallace-Hadrill. Connecticut: Greenwood Press. Geary, Patrick J. (1994). Before France and Germany: The Creation and Transformation of the Merovingian World. Oxford University Press. James, Edward (1988). The Franks. Basil Blackwell. Wood, Ian N. (1994). 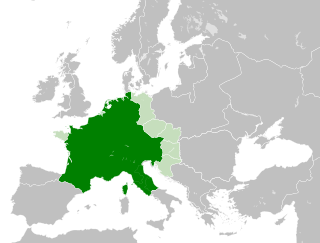 The Merovingian Kingdoms, 450–751. Longman. Year 629 (DCXXIX) was a common year starting on Sunday of the Julian calendar. The denomination 629 for this year has been used since the early medieval period, when the Anno Domini calendar era became the prevalent method in Europe for naming years. Pepin I of Landen, also called the Elder or the Old, was the Mayor of the Palace of Austrasia under the Merovingian king Dagobert I from 623 to 629. He was also the mayor for Sigebert III from 639 until his death. Childeric II was the king of Austrasia from 662 and of Neustria and Burgundy from 673 until his death, making him sole King of the Franks for the final two years of his life. Chilperic was the infant son of Charibert II, and briefly king of Aquitaine in 632. He was killed shortly after his father in 632, under orders by Dagobert I, Charibert's half-brother. The Basilica of Saint-Romain, Blaye, was an important Merovingian basilica, the resting-place of Charibert II, a son of Clotaire II who was briefly king of Aquitaine from 629 to his death in 632, and of his son. According to the 12th-century Chanson de Roland contained the body and relics of the Carolingian folk-hero Roland, who was a seigneur of Blaye in the eighth century, and of his companions Olivier and Turpin, deposited with grand solemnity in white marble sarcophagi. In Bordeaux across the Gironde the oliphaunt, Roland's split ivory horn, was preserved: li pelerin li veient ki la vunt, "the pilgrim may see it who goes"; a Seint Romain; la gisent li baron, "at Saint-Romain; there lie the barons", a sign interpreted by Gerald Brault to show that the pilgrimage sites at Bordeaux and Blaye had been established before the Chanson de Roland was composed. Indeed, in 1109 Hugh of Fleury concluded his account of the battle of Roncevaux with the words "whence Roland was carried to the citadel of Blaye and buried." The legend was long credited: in 1526 François I commanded the tomb of Roland to be opened.